Lostpedia Blog: The Lost Rewatch: 1x09 "Solitary"
The new format went over incredibly well, according to the first few comments, so I'm going ahead and finally getting started on this week's batch of episodes, beginning with the ever-juicy "Solitary," an episode which is just so much better now that we've seen "This Place Is Death." 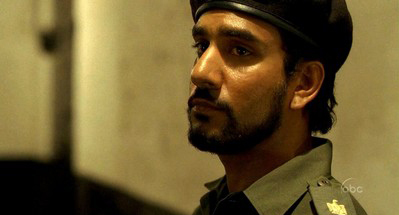 The episode concerns Sayid going into the jungle and meeting Rousseau, while flashbacks tell of Sayid's time in the Republican Guard and his being forced to torture Nadia, with whom he has fallen in love. Well, let's get started. Sayid finds a cable on the ground leading from the ocean to the jungle. What the cable's purpose is (or where it leads) isn't revealed at this point, but we later find out that it runs from the Looking Glass station underwater to an unknown point on the Island, and serves as an anchor for the station. However, Mikhail has described cables from the Flame to other DHARMA stations, so the cable may serve as a communications wire as well. Sayid is captured by one of Danielle Rousseau's many traps. Other traps include a spiky ball that swings like a pendulum, a crossbow rigged to a string, and giant nets that have caught Jack, Kate, and Ben. Danielle asks Sayid where Alex is. Alex is with the Others, and considers Benjamin Linus her father. She'll later be killed by Martin Keamy at the Barracks. We meet Ethan for the first time in this episode. It's rather fitting, introducing Danielle and Ethan in the same episode, because we'll later find out that Ethan aided Ben in the kidnapping of Danielle's daughter, Alex. Sayid fixes Rousseau's msuic box. The music box was broken by Ben during the kidnapping of Alex, as he knocked it over, also alerting her to his presence. There are several disrepancies between Danielle's story and what really happened. She claims that the rest of her team helped her dig out the temporary shelter, but we saw before that they were still living on the beach when she killed Robert, Brennan, and Lacombe, and was still on the beach as late as when Alex was kidnapped. She also mentions that they were "coming from the Black Rock," which they were not doing at all. They were trekking through the jungle after leaving the beach. Rousseau says that the Others were the carriers. This is the first mention of "the Others" on the show, and she's referring to Ben, whom she believed was a carrier when he kidnapped Alex. However, immediately after that, she claims to have seen no Others on the Island, which is not true due to the event I just referenced. She later claims that there's "no such thing as monsters," even though she clearly saw ole Smokey rip off Montand's arm. In flashbacks, Sayid helps Nadia escape the Rublican Guard. He'll spend the next years of his life trying to find her, eventually succeeding after his escape from the Island. Shortly afterward, she will be killed by Ishmael Bakir, leading Sayid to begin working for Ben. Why was Nadia killed? Jacob was there when she died as well, and he apparently had something to do with it, keeping Sayid out of harm's way while leaving Nadia to walk out into the street. Which begs the question: who really killed Nadia? Sayid tries to shoot Danielle, but discovers that the firing pin of her rifle has been removed. Danielle says that Robert made the same mistake when she killed him. This part of her story is true -- she shot him in the head after he tried to shoot her with a pinless rifle. Danielle mentions the sickness. Is the sickness caused by the monster? Most likely. Everyone who went into the hole under the Temple wall was "infected," and apparently all wished to kill Rousseau. If the monster is indeed Jacob's nemesis like I believe he is, then this simply takes his anti-human agenda to the next level. "It all ends the same way," he claims. Sayid hears the whispers for the first time while walking in the jungle. The whispers are one of the oldest mysteries that we've never really gotten an answer to, and we haven't even gotten the slightest clue as to what they are, really. I really hope that they're covered in the sixth season, because they're so intriguing. And that's it for episode 1x09, "Solitary." You can discuss the episode in this forum thread, read others' posts about it at the rewatch hub, and edit the episode's article.